About 20 minutes into The Secret Life of Pets, an entertaining but inconsequential animated movie, I was struck by a powerful feeling of déjà vu. It didn’t take long for me to ascertain the cause. The Secret of Pets is pretty much Toy Story with animals standing in for toys. There’s a Woody-type (the old reliable, much loved veteran whose territory has been invaded), a Buzz Lightyear-type (the brash newcomer), and (when we get into the wider world of New York’s alleys) a gang of animals who have been abandoned by their owners (this was a key plot element of Toy Story 3). 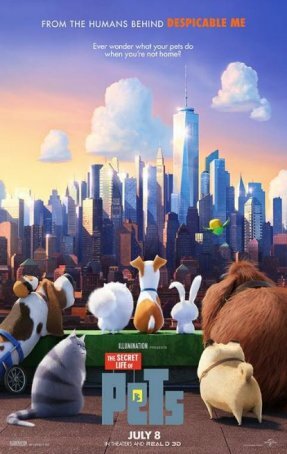 There’s bonding between the old timer and the newcomer, an attempted rescue by the old timer’s friends, and various other elements that keep The Secret Life of Pets in familiar territory. It makes sense. Toy Story is a proven commodity - a well-loved brand that has been hugely successful at the box office. There are worse sources to borrow from. The animation in The Secret Life of Pets has a generic quality. The film is heavily influenced by the Despicable Me style (not a surprise considering the cross-pollination between the Gru/Minions films and this one), which is okay except it doesn’t appear to have advanced in the last six years. I almost always come away from a Pixar film impressed by what the animators have accomplished. The Secret Life of Pets doesn’t score high on the “shock and awe” scale. The visuals aren’t bad but there’s nothing special here. The people look like caricatures and the creatures have a cartoonish, stuffed animal appearance. The backgrounds are the most arresting aspect of the presentation. The movie’s opening scenes show (as one might expect from the title) how pets spend their days after their owners head off for work. Most of these vignettes can be found in the trailers so, like Minions, the best parts of the movie are available (legally) on YouTube. We’re introduced to likeable hound Max (voice of Louis C.K. ), his neighbor Gidget (Jenny Slate), and the finicky fat cat Chloe (Lake Bell), who rejects her dried food in favor of refrigerator leftovers. The plot kicks into gear when Max’s owner, Katie (Ellie Kemper), brings home a new “pal” for Max, the bossy, oversized Duke (Eric Stonestreet). The inevitable turf war spills out onto the streets and, during the next day’s walk, Max and Duke slip away from their sitter and are captured by animal control workers. One rescue later, they find themselves out of the fire and into the frying pan with the gang of anti-domestication bunny rabbit Snowball (Kevin Hart) not taking kindly to a small deception they perpetrate. The rest of The Secret Life of Pets consists of Max and Duke trying to get home before Snowball and his posse finish them off while Gidget, Chloe, and a few friends try to find Max. The Secret Life of Pets offers its share of solidly amusing comedy; these moments are more effective than the rather hum-drum “action” scenes that are designed more to amuse children and provide fodder for video game adaptations than to engage adults. The movie does a good job anthropomorphizing the dogs, cats, birds, etc. Familiar characteristics are incorporated into the animals’ actions. For example, echoing the behavior of any domestic cat, Chloe can’t resist chasing (and pouncing on) moving moving streaks of light. The movie is preceded by a new seven-minute long Minions short that sees an intrepid quartet of the yellow fellows getting into the landscaping business. The breezy cartoon is suitably amusing and may be of more interest to some young viewers than the main feature (as was the case a few years ago when Disney offered a Frozen short prior to the live action Cinderella). It’s a savvy marketing ploy - some children uninterested in The Secret Life of Pets may be attracted by the Minions, even if they’re not on screen for long. This review may sound unnecessarily negative for a film that provides families with an opportunity for mid-summer bonding (even if it arrives in theaters a little too close to Finding Dory). Although lacking the strong emotional punch of a Toy Story, The Secret Life of Pets is strong enough that parents won’t fall into a catatonic state while watching it with their offspring. Unlike top-notch animated fare, however, it’s questionable whether this can be considered “destination fare” for the single adult. Three...better movies of Louis C.K. worse movies of Louis C.K.